Has anyone worked with the YuSynth Triple Clock divider? Is it something SSL should "investigate", or would you prefer something different? If so, please expand on your thoughts, and pass the "J". I'm waiting for STGs; it's the killer app for the Time Module system because of it's notion of internal time which knows when 8 bars have passed, etc. Would be good to have simultaneous outputs. Otherwise, take a look at Hexinverter's seqSquared. It's controller driven and a bit cryptic to program if you are used to knob-per-function, but functionality-wise it is very flexible and you maybe can get some ideas then implement them behind a traditional panel/knob & switch design. I'm building one right now, nearly finished, so I'll have more to say once it's in my rig. In the meantime, I agree about the odd divisions. Ive built one. Having trouble clocking it from my YuSynth LFO though, always have to feed it via the Random gates(!). Not sure what's up and haven't really spent any time investigating either..
Own a PCB for one....it's in my Mt. Everest backlog. Mee also planning to build one, together with LFO, VCAs and gate comparator from YU design. Yes, interesting module with possibility to do 3/5 divisions and so on. First I thought i would need three sequencers (which I dont have) but ther are other uses of course. The rhytmic patterns would be fun to explore. I have built it and I like it very much. I use it with audio too and it gives me a nice sub-octave, etc., square wave. Let's say I patch an LFO square wave into the module and I set two of the dividers to /2. I can then see by the LED's that the two divided outputs are indeed firing at half-time, but they are firing on opposing beats. If this were a 4/4 beat, one output is firing on the 1 and 3, the other firing on the two and the four. I'm guessing that the Reset function is used to get both outputs firing on the same beats, correct? If so, then would I just mult the same clock pulse I'm using to drive the dividers to drive the reset? I tried this and it didn't work, so I'm wondering what kind of signal I need for the reset? Or perhaps my reset isn't working? That's odd. If I understand, you've got the same LFO into dividers #1 & #2, and the divide switches set to the same /2 setting? Maybe if #2 wasn't set to /2 when the master clock was applied the timing of when it was switched to /2 threw it to the off beat? If you do a clean power up with nothing connected, set #1 and #2 to /2 and then connect the master clock, are they insync or opposite? Thanks John, that was the answer. I had applied the LFO before settting the two output divisions. If I set the divisions first and then apply the LFO, then the outputs are synchronized. 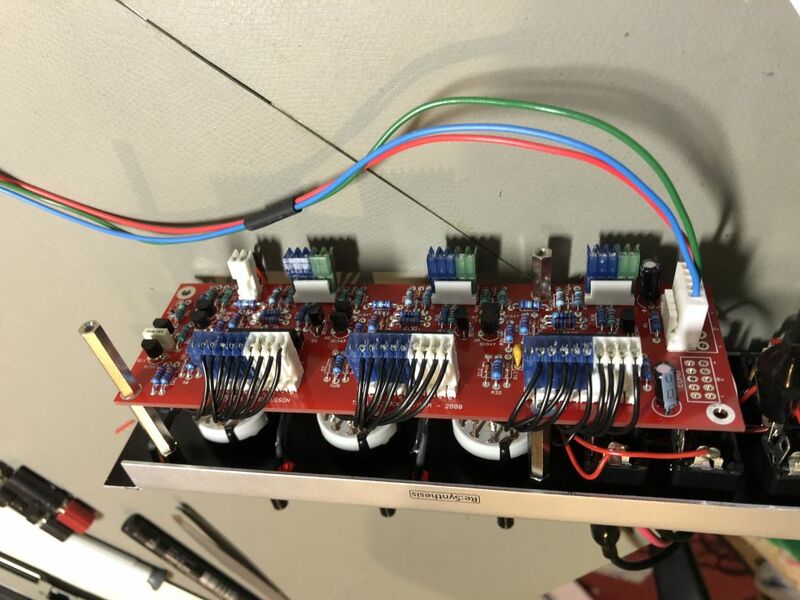 I've got an 808 kick drum module and I'm finishing up building Hexinverter's Liquid High Hat module, both of which will soon be receiving some odd time signatures from the Yusynth clock divider. I will soon be in the market for a MU clock divider, and a prefabbed unit would be much preferred. Don't rule out the multiplication features of the Tap Tempo LFO, which I love. With respect to Doug's original question, the Yusynth divider divides from /1 to /8, but gives you the desirable odd-numbered divisions. The Curetronic divider, by contrast, can divide up to /128, but only in even-numbered divisions. It might be nice to have a reasonable combination of the two; odd-numbered divisions and higher-than /8 divisions. I'm not sure I'd want a /128 division, but /16 and 1/32 would be handy. I love my Yu-Synth tripple divider. Keep in mind you can normalize/patch the ins and outs for a /512 division. 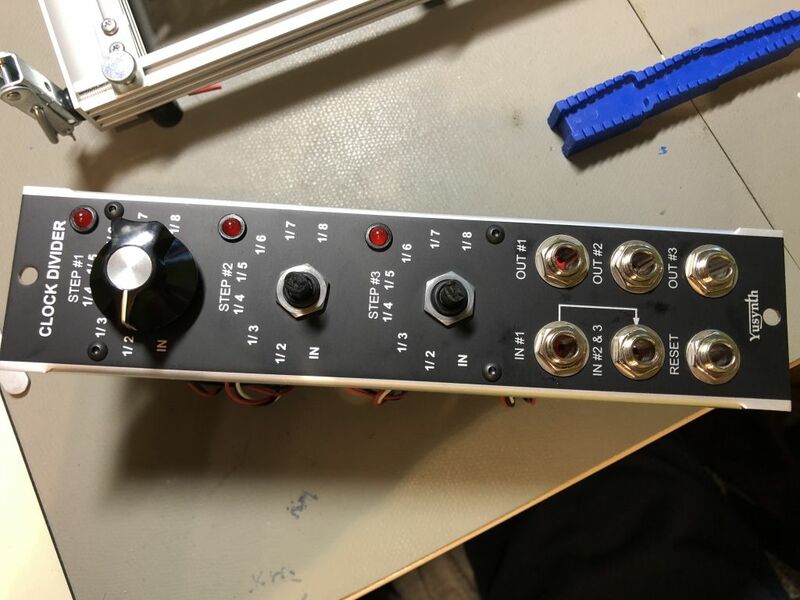 Did anybody convert this to Eurorack format ? If yes,can you share it ? I have a voltage controlled clock divider that I love. It’s a Eurorack PCB made by SSSR LABS, but it had an MOTM power header and they said it would be fine on 15V, and it is. It has two channels and can be normaled/daisychained. And it’s limited to “musical divisions”.